This is “Introduction to Factoring”, section 6.1 from the book Beginning Algebra (v. 1.0). For details on it (including licensing), click here. Determine the greatest common factor (GCF) of natural numbers. Determine the GCF of monomials. Factor out the GCF of a polynomial. Factor a four-term polynomial by grouping. Any natural number greater than 1 can be uniquely written as a product of prime numbers. This product is called the prime factorizationThe unique factorization of a natural number written as a product of primes.. The prime factorization of 60 can be determined by continuing to factor until only a product of prime numbers remains. Recall that the greatest common factor (GCF)The product of all the common prime factors. of any two natural numbers is the product of all the common prime factors. Example 1: Find the GCF of 60 and 140. Solution: First, determine the prime factorizations of both integers. Answer: The greatest common factor of 60 and 140 is 20. Example 2: Find the GCF of 504 and 1,080. The product of the common prime factors is 23⋅32. The GCF(504, 1080)=23⋅32=72. Note that we multiplied the common prime factors with the smallest exponent. The numbers 7 and 15 share no common natural number factor other than 1; we say that they are relatively primeExpressions that share no common factors other than 1..
Answer: The greatest common factor of 504 and 1,080 is 72. Given two or more monomials, it will be useful to find the greatest common monomial factor of each. For example, consider 6x5y3z and 8x2y3z2. The variable part of these two monomials look very much like the prime factorization of natural numbers and, in fact, can be treated the same way. Steps for finding the GCF of monomialsThe product of the GCF of the coefficients and all common variable factors. are outlined in the following example. Example 3: Find the GCF of 6x5y3z and 8x2y3z2. Step 1: Find the GCF of the coefficients. In this case, the GCF(6, 8)=2. Step 2: Determine the common variable factors with smallest exponents. In this case, the common variables with the smallest exponents are x2, y3, and z1. The factors 3x3 and 4z share no common monomial factors other than 1; they are relatively prime. Example 4: Determine the GCF of the following expressions: 30x6y and 18x4y2z. Example 5: Determine the GCF of the following three expressions: 12a5b2(a+b)5, 60a4b3c(a+b)3, and 24a2b7c3(a+b)2. Solution: First, determine the GCF of the coefficients. Answer: 12a2b2(a+b)2. Note that the variable c is not common to all three expressions and thus is not included in the GCF. Try this! Determine the GCF of the following: 60x4y3(x+2y)7, 45x2y5(x+2y)4, and 30x7y7(x+2y)3. We have seen that application of the distributive property is the key to multiplying polynomials. The process of factoring a polynomialThe process of rewriting a polynomial as a product of polynomial factors. involves using the distributive property in reverse to write each polynomial as a product of polynomial factors. To demonstrate this idea, we multiply and factor side by side. Factoring utilizes the GCF of the terms. The steps for factoring out the GCF of a polynomialThe greatest common factor of all the terms of the polynomial. are outlined in the following example. Example 6: Factor out the GCF: 7x4+21x3−14x2. Step 1: Identify the GCF of all the terms. In this case, the GCF(7, 21, 14) = 7, and the common variable factor with the smallest exponent is x2. The GCF of the polynomial is 7x2. Step 3: Apply the distributive property (in reverse) using the terms found in the previous step. Example 7: Factor out the GCF: 48a−16b+4c. Solution: There are no variable factors in common and the GCF(48, 16, 4) = 4. Example 8: Factor out the GCF: 25x3+15x2+5x. Solution: The GCF(25, 15, 5) = 5, and the common variable factor with smallest exponents is x1. The GCF of all the terms is 5x. The constant term 1 allows us to obtain the same original expression after we distribute. Example 9: Factor out the GCF: 15x6y4+10x5y3z2−20xy6z3. Example 10: Factor out the GCF: 24a6b2c5+8a7b5c. Solution: The GCF(24, 8) = 8, and the variable factors with smallest exponents are a6, b2, and c . Therefore, the GCF of all the terms is 8a6b2c. Of course, not all polynomials with integer coefficients can be factored as a product of polynomials with integer coefficients other than 1 and itself. If this is the case, then we say that it is a prime polynomialA polynomial with integer coefficients that cannot be factored as a product of polynomials with integer coefficients other than 1 and itself.. Solution: Prime: there are no polynomial factors other than 1 and itself. Try this! Factor out the GCF: 16x4y3−8x2y5−4x2y. In this section, we outline a technique for factoring polynomials with four terms. First, review some preliminary examples where the terms have a common binomial factor. Recall that 1 is always a common factor. If the GCF is the same as a term, then the factor 1 remains after we factor out that GCF. Solution: Rewrite the second term −(4x+1) as −1(4x+1) and then factor out the common binomial factor (4x+1). In this form, it is a binomial with a common binomial factor, (x−3). The steps that follow outline a technique for factoring four-term polynomials called factor by groupingA technique for factoring polynomials with four terms.. Solution: Group terms in such a way as to obtain a binomial with common factors. Step 1: Group the first two and last two terms and then factor out the GCF of each. The GCF of the first two terms is 2x2, and the GCF of the second two terms is 3. Step 2: At this point, the polynomial is a binomial. Factor out any factors common to both terms. Here (x+2) is a common factor. Step 3: Optional check: multiply to verify that we obtain the original expression. Solution: The GCF of the first two terms is a2 and the GCF of the second two terms is 1. Answer: (2a−3)(a2+1). The check is left to the reader. Solution: The GCF for the first group is 6x3. We have to choose 5 or −5 to factor out of the second group. Factoring out a +5 does not result in a common binomial factor. If we choose to factor out −5, then we obtain a common binomial factor and can proceed. Note that when factoring out a negative number, we change the signs of the factored terms. Answer: (x−4)(6x3−5). The check is left to the reader. The sign of the leading coefficient in the second grouping usually indicates whether or not to factor out a negative factor. If that coefficient is positive, factor out a positive factor. If it is negative, factor out a negative factor. When all the terms of a polynomial have a GCF other than 1, it is a best practice to factor that out before factoring by grouping. Solution: Here we notice that the greatest common factor of all the terms is 3y. Begin by factoring out the GCF and then factor the result by grouping. Sometimes we must first rearrange the terms in order to obtain a common factor. Solution: Simply factoring the GCF out of the first group and last group does not yield a common binomial factor. We must rearrange the terms, searching for a grouping that produces a common factor. In this example, we have a workable grouping if we switch the terms a3 and ab. Factoring such polynomials is something that we will learn to do as we move further along in our study of algebra. For now, we will limit our attempt to factor four-term polynomials to using the factor by grouping technique. To find the greatest common factor (GCF) of any collection of natural numbers, first find the prime factorization of each. The GCF is the product of all the common prime factors. The GCF of two or more monomials is the product of the GCF of the coefficients and the common variable factors with the smallest power. If the terms of a polynomial have a greatest common factor, then factor out that GCF using the distributive property. Divide each term of the polynomial by the GCF to determine the terms of the remaining factor. Some four-term polynomials can be factored by grouping the first two terms and the last two terms. Factor out the GCF of each group and then factor out the common binomial factor. When factoring by grouping, you sometimes have to rearrange the terms to find a common binomial factor. After factoring out the GCF, the remaining binomial factors must be the same for the technique to work. Not all polynomials can be factored as the product of polynomials with integer coefficients. In this case, we call it a prime polynomial. Give the prime factorization of each number and determine the GCF. Determine the GCF of all the terms. Given the GCF, determine the missing factor. Are the following factored correctly? Check by multiplying. Use polynomial long division to show that the given factor divides the polynomial evenly. 71. Show that (x−1) is a factor of (2x3−5x2+4x−1). 72. Show that (x+3) is a factor of (3x3+7x2−4x+6). 73. Show that (3x−2) is a factor of (3x3+4x2−7x+2). 74. Show that (2x+1) is a factor of (2x3−5x2+x+2). 75. The height in feet of an object tossed into the air is given by the function h(t)=−16t2+32t, where t is the time in seconds after it is tossed. Write the function in factored form. 76. The height in feet of an object dropped from a 16‑foot ladder is given by the function h(t)=−16t2+16, where t is the time in seconds after it is tossed. Write the function in factored form. 77. 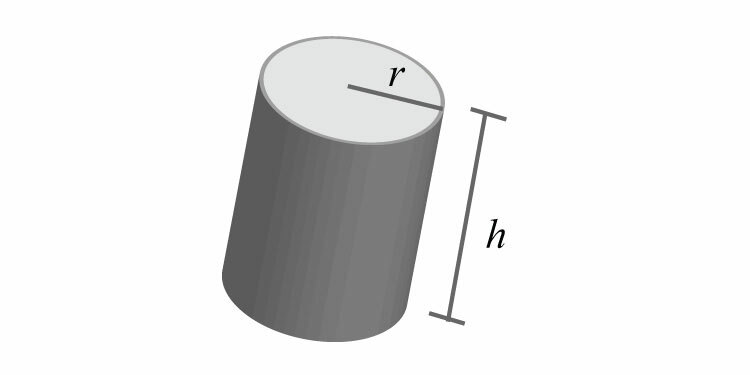 The surface area of a cylinder is given by the formula SA=2πr2+2πrh, where r represents the radius of the base and h is the height of the cylinder. Express this formula in factored form. 78. The surface area of a cone is given by the formula SA=πr2+πrs, where r represents the radius of the base and s represents the slant height. Express this formula in factored form. Factor out the GCF first and then factor by grouping. 111. Research the Euclidean algorithm for finding the GCF of two natural numbers. Give an example that illustrates the steps. 112. Research and discuss the contributions of Euclid of Alexandria. 113. Explain what factoring is and give an example. 114. Is 5x(x+2)−3(x+2) fully factored? Explain. 115. Make up a factoring problem of your own and provide the answer. Post the problem and the solution on the discussion board.